20 MILLION MILES TO EARTH, 1957. 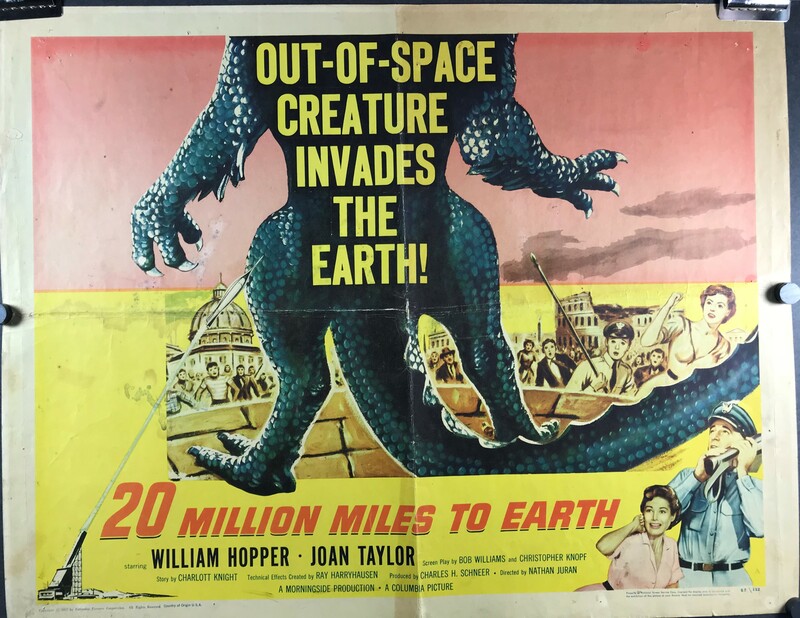 Original Half Sheet (22” x 28” / 72 x 92 cm) folded movie poster starring William Hopper and Joan Taylor. Directed by Nathan Juran and written by Robert Creighton Williams. “Out-of-space creature invades the Earth!” The first United States spaceship to travel to Venus makes a crash landing in the ocean near Sicily. A dangerous stowaway aboard the ship is set free during the crash. The lizard-like creature grows to gigantic proportions and wreaks havoc in nearby Rome. Thanks to Ray Harryhausen’s stop-motion animation technique he created, called Dynamation, the wonderful 50’s monster imagery really comes to life! This poster is in good C7 condition with very bright colors. Fold lines and creasing are evident, along with some staining on the left-hand side of the poster. Each corner of the poster has pin holes, and there is a small tear near the top right hand-side, and at the middle fold line on the left-hand side of the poster. Linen Backing is available for this poster for an additional $60 and will remedy these condition flaws.